Psoriasis plaques represent the first indication that someone is experiencing a psoriasis outbreak, characterized by bright red, inflamed lesions overlaid with silvery-white scales, which are dead skin cells. These plaques are commonly found on the knees, elbows, lower back and scalp but can appear anywhere on the body. These lesions cause symptoms of unrelenting itching, burning, swelling and soreness, sometimes so severe that they debilitate the psoriasis patient, restricting movement and making it almost unbearable to wear everyday clothes. In addition, the physical pain of psoriasis compounded by the emotional pain frequently forces people to become housebound due to embarrassment and self-consciousness of the unsightly plaques. Plaques are slighted elevated above the skin unaffected by psoriasis. Plaques can be pea-sized or several inches across. 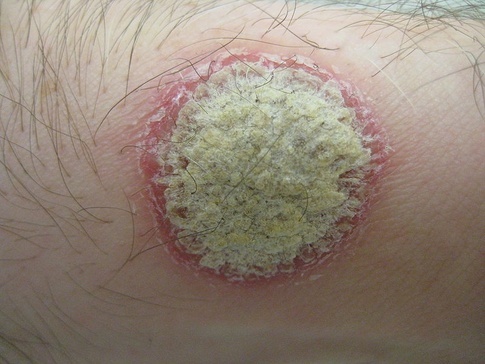 Lesions may grow until they overlap with other lesions, creating large areas of psoriasis. Plaque shapes are generally oval but may exhibit irregularities, especially when certain areas of the plaques are scratched more than others. Plaques covering joints, feet and palms may crack and split forming fissures deep enough to cause bleeding. Some plaques exhibit a pale, whitish "halo" around the edges, medically referred to as Woronoff rings. Doctors think this phenomenon is due to plaques releasing a prostaglandin inhibitor substance that reduces the amount of capillary-dilating prostaglandins affecting the lesions. This means skin surrounding psoriasis plaques contains less blood than normal. Color of plaques is often deemed "salmon-colored" rather than red. In addition, when psoriasis affects legs, it may exhibit a blue tinge. Interestingly, psoriasis lesions are usually symmetrically opposed on the body. For example, a patient with psoriasis on one knee or elbow will have the same size lesion on the other knee or elbow. Scalp psoriasis is dry, crusty, and scaly, but people often confuse it with seborrheic dermatitis, which is greasy. Plaque psoriasis affecting nails will create pits, indentations, ridges and discolored areas. Rupioid psoriasis-- Affecting a few individuals suffering from severe arthritis, it is characterized by cone-shaped, limpet-like plaques on arms and legs that last nearly three months. Histopathology showed evidence of excessive dermal edema, or fluid retention, and moderate infiltration of inflamed cells. Lichenified psoriasis--Lesions that have been itched and rubbed frequently may develop into extremely thick plaques that are more difficult to remove. Koebnerized psoriasis--This psoriasis occurs over skin areas suffering previous injuries, such as cuts, infections, insect bites or surgical wounds. Photosensitive psoriasis--While the sun or ultraviolet light relieves the suffering of most psoriasis patients, the light will exacerbate the symptoms of a few. Frequent sun exposure for these sun sensitive individuals will increase inflammation of the lesions on the face, hands, neck and upper arms. Skin type classification based on the Fitzpatrick system that describes skin as "white or pale and burning easily", "darker skin that tans rather than burns"
Depending on the severity and type of psoriasis plaques, treatment usually consists of topical steroids, prescription medications, phototherapy or a combination of these remedies. Although psoriasis is not curable, one or more treatments usually can manage and control the symptoms.